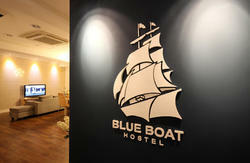 Welcome to blueboat Haeundae guest house! We are located at very convenience place. And we are located in downtown of haeundae so it is easy to find shopping center, bank, restaurant. Traditional market also is near. The second floor is for family & men and the third floor is for women only. There are powder room, rest-room and shower booth in each floor and basic things will be provided such as towel, shampoo, body cleanser, toothpaste, free wi-fi and breakfast. Also we got door-lock with every door in this buliding so that you can feel safe. We wish that make some good memories with blueboat in Busan! entering between Yugane and Nature Republic.